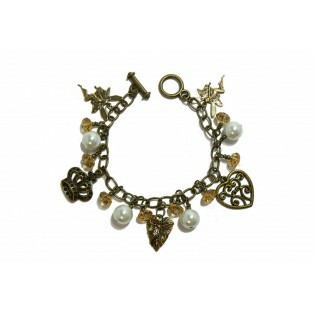 Enchanting and spellbinding Antique-Style Gold Plated Charm Bracelet. Adorned with lustrous white glass pearls, sparkling golden yellow diamond crystals and fairytale charms. A perfect gift for a Princess. This Antique-Style Gold Plated Charm Bracelet measures 7.5" (20cm) long and will fit any standard size wrist. I have fitted an antique gold plated toggle style clasp which is "Nickel Free" to comply with EU directives.